Members of Russian motorcycle club the Night Wolves have been denied entry into Poland for their symbolic ride through Europe to commemorate the Soviet advance against the Nazis 70 years ago. It was scheduled to end in Berlin on Victory Day, May 9. 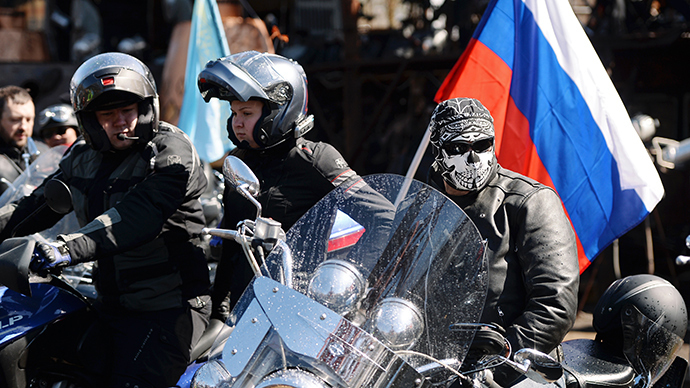 “Every single biker has been turned back, without explanation,” Andrey Bobrovskiy, the leader of the convoy, told TASS. The BBC said that Polish border guards barred entry to about 15 motorbikes, two cars and a van that accompanied the ride. On the group’s Livejournal blog, the Night Wolves said they had been held at the border for several hours for thorough questioning, searches and document checks, before being “declared personae non grata.” Dismissing reports that some managed to cross the border individually at separate checkpoints as “fabrications,” they have now returned together to the Russian consulate in the Belarusian city of Brest. The bikers said about 100 more of their group are on their way to the border, and that contingent could make another attempt to cross into Poland on Tuesday. The German government also officially revoked a “handful” of visas on Monday, while earlier the Czech Republic said it would not sanction the convoy on its territory. The planned trip, which had war memorials in Wroclaw, Prague, Vienna and Munich on its itinerary, provoked heated debate, particularly inside Poland, where thousands signed up to social media groups both endorsing and condemning the Russian bikers. Scores of Katyn Raiders gathered on the Polish side of the border with Russia on Monday morning to welcome the Night Wolves. “It is extremely disappointing that our friends will not be able to come,” one of their members told TASS on Monday. The Polish club has confirmed they will be following the original Night Wolves’ route through Europe out of solidarity, laying wreaths at graves of those who fell fighting against the Axis powers in World War II. The Night Wolves were the Soviet Union’s first (and unapproved) biking club during the 1980s, but in recent years have enjoyed the patronage of President Vladimir Putin, who rode a Harley-Davidson with them at a special exhibition in 2011. Their leader Aleksandr Zaldostanov, known as ‘the Surgeon’ after his former profession, is a prominent member of Anti-Maidan, a political movement aimed at thwarting a government toppling in Russia, similar to that in Ukraine last year. Zaldostanov is also on the US and Canada’s sanctions list for his participation in the events that led to the secession of Crimea from Ukraine.